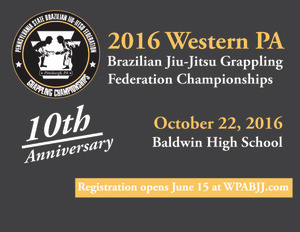 The annual Western Pennsylvania Brazilian Jiu-Jitsu Championships is nearly here. On Oct. 22, more than 300 competitors as well as their friends and family will descend on on Baldwin High School (our new bigger, better venue!) to chase the Pittsburgh area’s most prestigious competition titles. This our 10th event, and each year we have seen the tournament grow. In the last decade, jiu-jitsu in Pittsburgh has exploded with a slew of new gyms and new grapplers sprouting up around the city. The sport at large has grown as well, which means that we see competitors traveling from as far as New York, Canada, and New Jersey to take part in our event. For business owners, this is an opportunity to not only align yourself with a positive community event but also to have your business showcased to a significant number of potential customers. Spaces for sponsors are limited, and we sell out every year, so act fast! Email Sensei Sonny Achille (at steelcityma@aol.com) to confirm your spot.